After a few weeks off to attend and then recover from the London Film Festival, Why Haven't You Seen...? is back and for the next couple of weeks I'll be featuring some Halloween double bills. 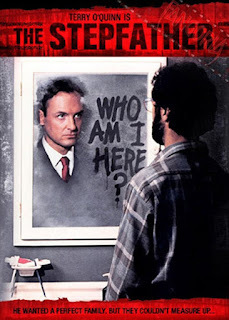 In The Stepfather, Jerry Blake (Terry O’Quinn) is in his late 30’s, he lives with his new wife Susan (Shelley Hack) and her troubled 17 year old daughter Stephanie (Jill Schoelen) in a middle class home in a safe neighbourhood. Jerry wants to create a perfect family life, in fact he’s so obsessed with this that Stephanie begins to suspect that Jerry has a sinister secret and begins investigating his past. The sequel performs some plot gymnastics to open with Jerry (O’Quinn again) in a mental hospital. He soon escapes, becoming Gene Clifford, a psychiatrist. He targets Carol (Meg Foster, a divorcee with a 12 year old son (Jonathan Brandis) and soon they’re engaged, but Carol’s friend Matty (Caroline Williams) has a bad feeling about Gene. I’m always surprised that The Stepfather isn’t more widely seen. It’s always had a strong reputation but, even among horror fans I know, there are many people who it has either passed by entirely or who haven’t revisited it in years, or even decades. As far as I can tell it was a modest hit on release, enough to spawn three sequels, but it, along with it’s final girl Jill Schoelen, seems to have faded from mainstream consciousness over the years, despite a dedicated cult following. Obviously if you’ve not seen the original film you’re unlikely to have caught up with its sequel, which doesn’t have the strong reputation that the first film has built. The term ‘psychological thriller’ is often thrown around by producers who don’t want their film ‘ghettoised’ into the Horror genre, but The Stepfather earns the tag. Donald E. Westlake’s screenplay - the premise of which is loosely inspired by real life murderer John List - strikes much closer to a thriller than it does a pure slasher, trading more on investigation and tension than on brutality and bloodletting and it’s truly interested in its characters and their motivations. Westlake gives Stephanie a bit more depth than is often afforded a final girl. Stephanie hasn’t been dealing well with her father’s recent death or with Jerry’s quick arrival as part of the family and she’s getting in trouble for acting out in school. This ties neatly into the plot because the people around Stephanie - her mother, her prospective boyfriend and even her psychiatrist - think that her attitude to Jerry is part of this acting out. As a step-child, it’s easy to buy into that dynamic. It pays dividends here that Westlake gives us more knowledge than the characters. We know, from the extremely creepy opening sequence, panning over the scene of the murders of his previous family to ‘Jerry’ becoming literally a new man, that Jerry is everything Stephanie fears he is. This only ratchets up the tension inherent in O’Quinn’s performance. The film Westlake and director Joseph Ruben (Joyride, Sleeping With The Enemy, Return To Paradise) are making here is one that attempts to dig into the Reaganite ideal of America and expose its dark underbelly. In many ways it’s an indictment of nostalgia for ‘the good old days’ which in every way from his morality to the way he incessantly whistles Camptown Races, Jerry is wedded to. 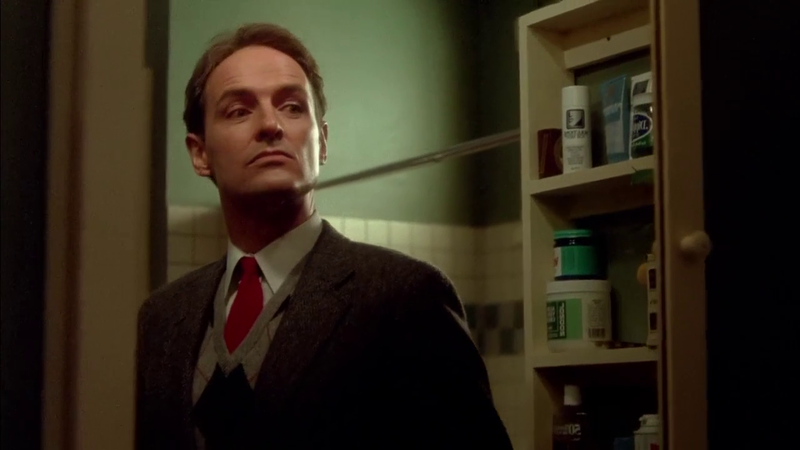 As Jerry, Terry O’Quinn teeters on the edge of going too far, but he always makes the performance just restrained enough to not make it laughable that the other characters don’t suspect the darkness lying behind his naive but charming dedication to the white picket fence version of the American Dream. The private moments that do spill over into madness (a scene in the garage after a minor slight, for instance) are chilling, but it’s when he can’t hide anymore that O’Quinn delivers a truly terrifying monster, the confused yet sinister delivery of the film’s signature line “Who am I here?” sealing the deal. O’Quinn delivers the film’s standout performance, but Jill Schoelen makes for a terrific final girl. Her Stephanie is smart and resilient, you can see from the outset that she’s not going to be easy for Jerry to deal with. More than that though, Schoelen could represent the epitome of the ‘girl next door’ (or at least the girl you wish had lived next door) but she has more depth than the usual version of that character, and is presented not as a fantasy figure but as a girl struggling with loss and with the idea of someone taking the place of that loss. Schoelen sells this well, while also being a final girl we can fall for and root for. I’ve always seen her as one of the more underrated scream queens of the 80s. The investigative side of The Stepfather is a mixed bag, with Jim Ogilvie (Stephen Shellen), a superfluous character who is related to Jerry’s previous family and has tracked him for a year, monopolising too much screen time that could give much of the same function to Stephanie, but Ruben absolutely delivers on the horror. The first scene delivers its violence through implication, showing us the magnitude of what Jerry can do and building tension for later. The final scenes take a turn into slasher formula (right down to Schoelen’s shower scene, surely one of the most gratuitous in cinema history), but they’re very well choreographed and executed, managing tension and violence equally effectively. Overall it’s a great entertainment with more of a brain than most other films in its genre. 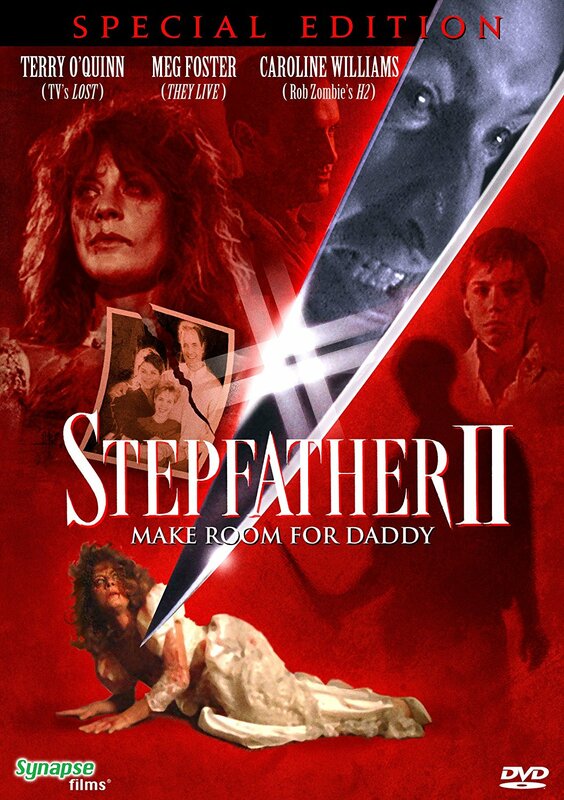 Jeff Burr’s Stepfather II doesn’t measure up to the first film, but it deserves more than to be written off. Leaning more heavily on slasher tropes (it has a higher body count and is gorier, over director Jeff Burr’s objections), the film nevertheless has a few interesting ideas. When we catch up with Jerry in the first film he is newly married. We see a few glimpses of him setting up a new life but the sequel shows us his grooming process, the final result isn’t that different, but it does give the film a fresh angle. O’Quinn is clearly having a ball revisiting the character (now called Gene). He’s winking at us a little bit more this time, but once again he seems invested in making this guy credible, and from that come some good scares. Caroline Williams also turns in a strong performance as Matty, Meg Foster may have the female lead as ‘Gene’s’ prospective wife, but Williams gets the best written character, and she makes the most of it. A tense moment between Matty and Gene on a park bench is the film’s dramatic highlight. The star of this film though is Jeff Burr. Burr has had a rough ride in the industry and has said he only considers 3 of his films to truly be his work (this isn’t one of them), but he’s clearly a talented craftsman. Stepfather II is well shot and well paced throughout, with more than a few standout moments (the lighting and framing of the sequence leading up to Matty’s murder is especially good), it’s mostly down to him that Stepfather II feels like more than an empty retread of a better original, and remains well worth a look. Both films are available on Special Edition DVD (and Blu Ray in the case of the first) in the US. The UK still only has the barebones, non-anamorphic, long deleted DVDs which came out on Carlton’s Silver Collection. Come on Arrow, let’s have some special editions.